PURREALIST (AUS) (Chestnut 2004-Stud 2008). 2 wins-1 at 2-to 1400m, MRC Caulfield Guineas Prelude, Gr.3. Sire of 135 rnrs, 74 wnrs, inc. SW Hawkspur (BRC Queensland Derby, Gr.1), Melrose Place, Storm Approach, SP Baligari, Adjuster and of Pure Justice, Omega Three - Travel Number One (H.K. ), Pure Hustle, Pure Whisper, Devil Hawk, Purrfect Paragon, Bold Senator, Imperial Hawk, Lani Girl, Tansy, Anjea, Klishina, Pure Reality, Pure Addiction, etc. Purrpussful (f. by Purrealist). Winner. See below. Gloray (f. by Street Hero). 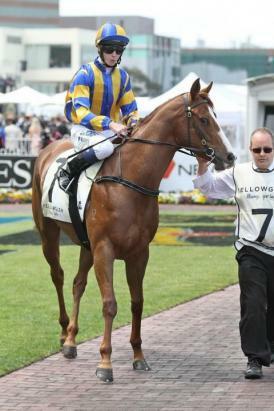 Winner at 1150m in 2014-15 in Aust. De Little Engine (Encosta de Lago). 6 wins from 1600m to 2600m, A$288,890, to 2014-15, VRC Banjo Paterson Series Final H., Bitalli H., MRC Sportingbet Best Tote H., KS Environmental H., Ballarat TC People at Work H., 2d MRC Galilee Series Final H., L, Edithvale Aspendale Sporting Club H., 3d VRC Bagot H., L, MRC LU Simon Builders H.
Cardiac. 2 wins at 1400m, 1600m in Aust. Newstar Lass. 2 wins. See above. Rhodin Drive. 3 wins-1 at 2-at 1200m, 1400m, A$84,950, to 2014-15, Ipswich TC Tradies Day P., 3d Hawkesbury RC Evergreen Turf Claret 2YO S., Ipswich TC Schweppes TL Cooney H., ATC AMWU National H., 4th Qld Tatt's RC Daybreak Lover S., L.
Plaisterer. 4 wins from 1¼m to 1½m, Doncaster Moss Properties H., Epsom Planned Maintenance H., Haydock Littlewoodsbingo.com H., 2d Ayr Williamhill.com Bonus25 H., 3d Ayr Williamhill.com Bonus25 H.
MIDAS TOUCH (Unaccounted For). 11 wins-5 at 2-from 1100m to 2200m to 2015 in Turkey, Istanbul Tay Deneme, L, TYAY Ve Sah Der, L, 2d Istanbul A Cemal Kura, L, II. Inönü, L, 3d Istanbul Fatih Sultan Mehmet, L, Caldiran S., L.
Ballycotton Bay. 9 wins-1 at 2-from 1400m to 1700m, €109,087, Milan Premio Segrino, Siracusa Premio Sicilia, 3d Milan Premio Pontenure, Premio Groppello. WARRIOR GIRL (Fernando). 5 wins at 2 in 2015 in Turkey, Istanbul I. Inönü, L, 3d Istanbul Sadun EG Atig, L.
YALPAGAN (Unaccounted For). 4 wins at 1400m, 1500m in 2015 in Turkey, Istanbul Burhan Karamehmet, L, 4th Istanbul Kocatepe, L.
Race Record: 4 Starts 1-1-0 A$14,170.